Since graduating from Temple University’s Tyler School of Art in 1976, Robert Loebell has worked consistently as an artist. Along the way, he worked as a handyman and house painter before settling into his career as an art teacher in the West Hartford Public School system for nearly three decades. Wood sculpture has allowed Loebell to capture his artistic voice deeply rooted in literature and photography. Some of his previous pieces have looked to Henry David Thoreau’s “Walden” and James Joyce’s “Ulysses” for inspiration. 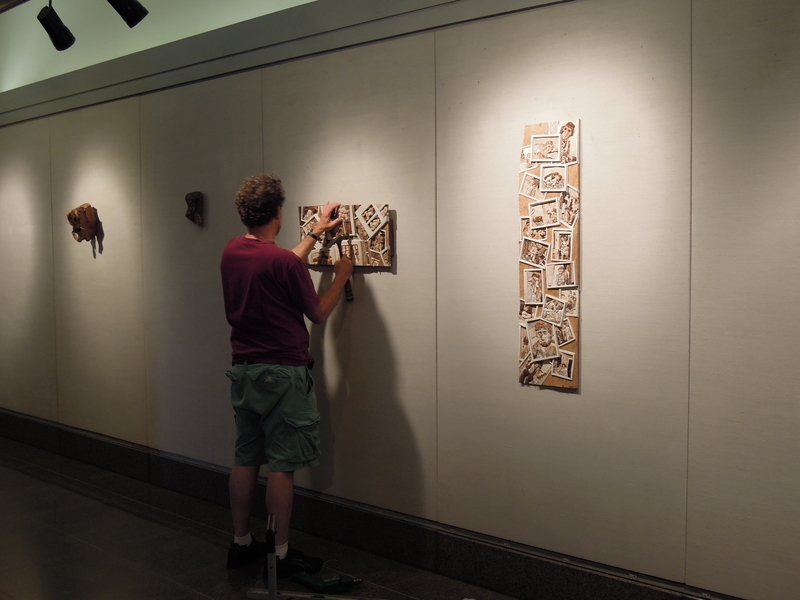 In preparation for the opening reception of “Reminiscing,” a wood relief exhibit, this Thursday at 5pm in our 100 Pearl Street Gallery, Loebell answered a couple of questions about his work, his creative process, and what inspires him. 1. What inspired you to translate photography to sculpture on wood? I started looking at photographs when I was thinking about what I wanted to do for my Weir Farm residence. I just went to look at the archives there and was totally fascinated by the old pictures. 2. Your work on display depicts images from Connecticut’s Weir Farm and New York’s Governors Island. What about those places’ made them rich for exploration? Are there any historic/significant sites in the Hartford region you would like to explore? It was really luck. The Weir Farm archives got me started on the possibilities of using archival photographs, and the theme of the Governors Island show was ‘Encounters,’ so I just started looking at the history and found all these pictures on the Library of Congress web site. It starts as an art idea but the research is fun and gives another layer of meaning to the pieces. I’m sure there are places in Hartford I’d be interested in, but I haven’t researched anything specific. I’m open to suggestions. 3. Can you describe your process? How do you find your materials (wood, photographs) and then make your pieces? They start with the photographs. I have a bunch of wood sitting around, although that may need replenishing soon. I try to figure out my idea (flat relief, 3-d), and then figure out what wood will work. Sometimes I buy a piece of a certain wood, but I like it better when the wood just jumps out at me. I do all the carving first, then the burning for the darks, and then white acrylic. 4. You work as an educator and some of your past work has drawn inspiration from literature. How do your students and your work as a teacher inform your work? What literary or cultural figures/works are you interested in lately? Students ask the best questions, so when I show them my work, I better be ready to answer their honest and direct questions. Why? How much? How long does it take? What’s it about? I’ve been reading Hillary Mantel’s books about Oliver Cromwell, which are fun and bawdy. They probably won’t find their way into any works but who knows? I’m interested in seeing the show at the Guggenheim by Rineke Dijkstra the photographer. Her work strikes me as deceptively simple and intimate. Many thanks to Loebell for answering my questions. “Reminiscing” will be on display until September 28th in our 100 Pearl Street Gallery. Join us to celebrate Loebell’s work with the artist himself at the opening reception of “Reminiscing” this Thursday, Jul 26 from 5-7pm in our 100 Pearl Street Gallery—click here for more information.